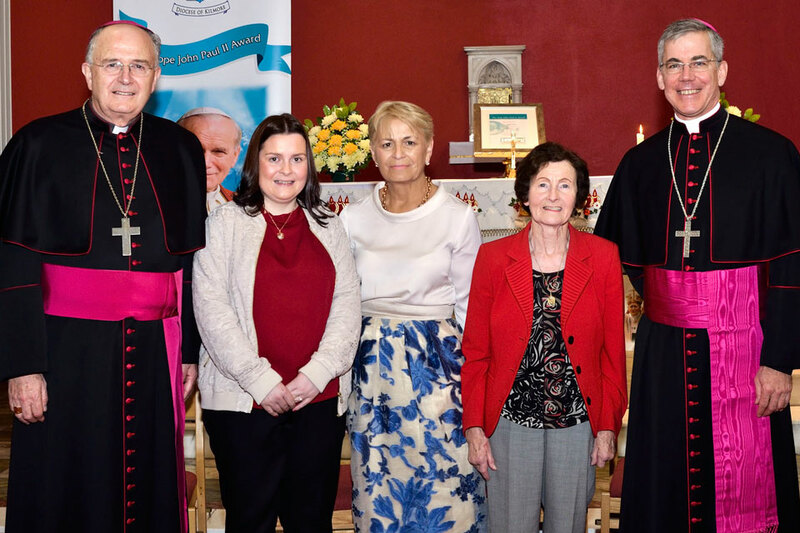 On Saturday 15 October, 2016 the diocese of Kilmore held their Annual Pope John Paul II Award ceremony in the Diocesan Pastoral Centre, Cavan. The Apostolic Nuncio to Ireland, Most Reverend Charles J. 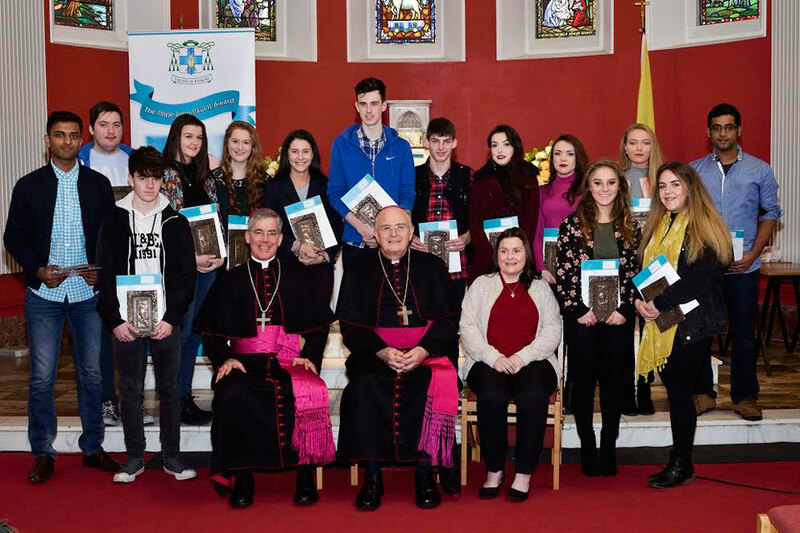 Brown, presented 61 young people from the diocese with their Pope John Paul II Award at a special ceremony at which the Bishop of Kilmore, Most Reverend Leo O’Reilly, presided. 14 people from across the diocese of Kilmore received the Papal Cross Award. 33 received the Gold Award and 14 received Silver and Bronze. Carina McGinnell, Diocesan Director for Youth and Young Adult Ministry, welcomed all present to the ceremony especially the participants, their families, mentors, parish priests and school representatives as well as Archbishop Brown, Bishop O’Reilly, representatives of the local Knights of St. Columbanus and the Diocesan Youth Ministry Volunteers, Claire McGlade and Kathleen McCabe. After a short liturgy, Bishop O’Reilly added his words of welcome to all present, especially to the Nuncio who was on his first official visit to Cavan. He commended the young people for participating in the Award and for the witness they give in their parishes and schools. He also thanked those who supported the young people in achieving their Award. Archbishop Brown echoed the words of Bishop O’Reilly. A native of New York, the Nuncio’s great great-grandfather was Murphy from Rossinver in the parish of Ballaghameehan in Co. Leitrim from where there were three Award recipients this year. He said that he was delighted to attend the presentation ceremony and to present the Award to a cohort of fine young people who have taken such an active part in the life of their Church, in the life of their community and society. It was a source of much joy for him to see the Pope John Paul II Award spread across Ireland but also overseas. Also in attendance at the presentation ceremony were Msgr. Piotr Tarnawski who had just taken up post as First Secretary at the Dublin Nunciature a few days beforehand, Fr. Ultan McGoohan, Diocesan Director of Pastoral Services, and Seán Coll, Director of the Kilmore Diocesan Pastoral Centre. The Pope John Paul II Award is run in most Irish dioceses and was launched in the diocese of Kilmore in 2011 with the valued and valuable support of the Knights of St. Columbanus. Each young person taking part in the Award chooses to get involved in parish life as well as participating in some social awareness activity in their locality. All Award recipients complete a presentation in which they reflect upon the tasks they undertake in the light of gospel values. Finally they reflect on how the Award helps them understand and appreciate the contribution that young people can make in the Church today.